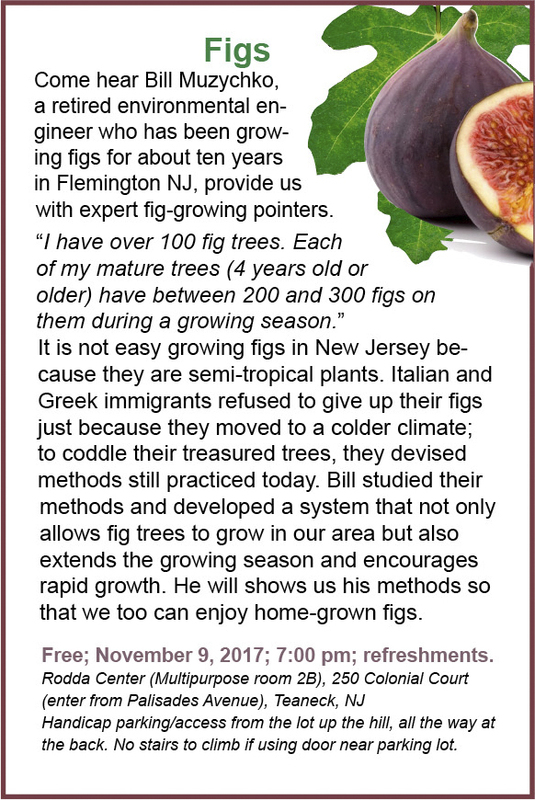 Come hear Bill Muzychko, a retired environmental engineer who has been growing figs for about ten years in Flemington NJ, provide us with expert fig-growing pointers. It is not easy growing figs in New Jersey because they are semi-tropical plants. Italian and Greek immigrants refused to give up their figs just because they moved to a colder climate; to coddle their treasured trees, they devised methods still practiced today. Bill studied their methods and developed a system that not only allows fig trees to grow in our area but also extends the growing season and encourages rapid growth. He will shows us his methods so that we too can enjoy home-grown figs. Free; November 9, 2017; 7:00 pm; refreshments. Handicap parking/access from the lot up the hill, all the way at the back. No stairs to climb if using door near parking lot.